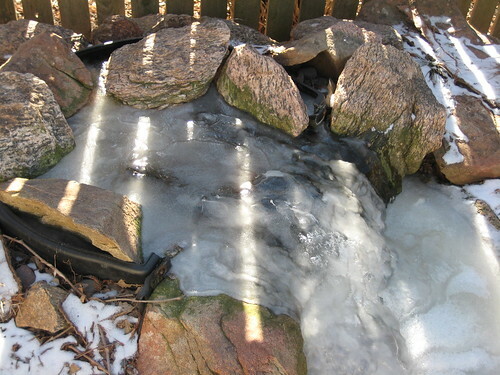 The waterfall has partially thawed, the pond has not. 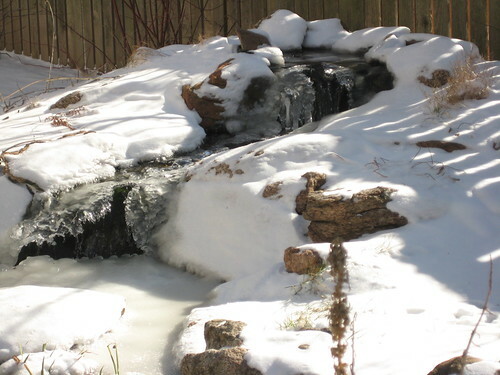 The mossrock surrounding the pond is rather picturesque under freshly fallen snow. It’s the halfway point between the winter solstice and spring equinox. Already, we are adding over 2 more minutes of daylight a day. The average high temperature finally reaches the freezing mark – and starts going up a degree every couple of days after that. That may seem unremarkable, but the average high has been between 29 F and 32 F for nearly 6 weeks. February 4 is the day with the most subzero readings. Anecdotally, the first week of February always seems like a cold snap, but the last really severe one. In some respects, late winter and early spring are the most difficult to deal with. Things are starting to warm up, but progress is slow. I was heartened, though, to hear birdsong on my last few morning walks to the train – if the birds can have faith that spring is coming, so can I.
I was disappointed to read that the Chicago Tribune’s garden blog is ending. Beth Botts always had lots of interesting postings, and the stuff about her garden was especially relevant to me, since she lives in Oak Park as well. It’s hard to lose any garden prose this time of year, when there is so little garden to be seen. With our recent cold snap, the pond has completely frozen over except for where the the deicer sits (and that was mostly frozen over this morning). It takes a good long while for the biofalls to get a coating of ice, but the photo above shows that it’s been cold enough for long enough. The water is still flowing under there, though the ice buildup has meant that I’ve had to top off the water (via the skimmer, which has been mostly free of ice) a couple of times. If we get the predicted thaw this weekend, the pond will be overflowing! 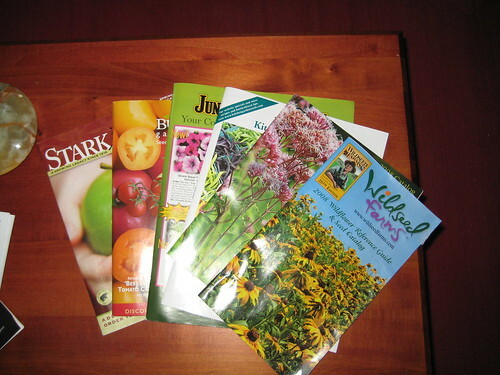 It’s the coldest week of the year, so it’s a comfort that it’s also the time of year when all the seed and plant catalogs arrive. My eyes are certainly thirsty for green, and with a current temperature of 5 F outside, I’m not about to start my winter pruning today! Thanks to the folks at the National Wildlife Federation, I now have a fun science project for the spring. Project Budburst is looking for volunteers around the country to note some of the springtime events in their gardens and neighborhoods. Sadly for my native-gardening ego, there’s only one of their native flowers in my garden, but I’m doing really well on having access to forsythia and dandelions. This looks to be easy to do whether you’re a garden blogger or not. Join in! Today we reach perihelion, the Earth’s closest point in its orbit around the sun. In a day or so, we’ll have also reached our latest sunrise of the year: 7:19 am. (To tell the truth, it’s been stuck around there for several days now, but the 4th is roughly the midpoint of the stretch of 7:19s.) I’ll be especially grateful for earlier sunrises since I’m walking to work at that time, and it’s nice to see some sun. The next winter milestone will be two weeks from now: the average coldest day of winter. We’re two weeks past the solstice, and four weeks past the earliest sunset. And in just over four weeks, we’ll be halfway between the solstice and the equinox, and the days will start getting noticeably longer.